From Goodreads.com: "Deanna Fei was just five-and-a-half months pregnant when she inexplicably went into labor. Minutes later, she met her tiny baby who clung to life support inside a glass box. Fei was forced to confront terrifying questions: How to be the mother of a child she could lose at any moment. Whether her daughter would survive another day--and whether she should. But as she watched her daughter fight for her life, Fei discovered the power of the mother-child bond at its most elemental. Girl in Glass is the riveting story of one child's harrowing journey and a powerful distillation of parenthood. With incandescent prose and an unflinching eye, Fei explores the value of a human life: from the spreadsheets wielded by cost-cutting executives to the insidious notions of risk surrounding modern pregnancy; from the wondrous history of medical innovation in the care of premature infants to contemporary analyses of what their lives are worth; and finally, to the depths of her own struggle to make sense of her daughter's arrival in the world. Above all, Girl in Glass is a luminous testament to how love takes hold when a birth defies our fundamental beliefs about how life is supposed to begin." 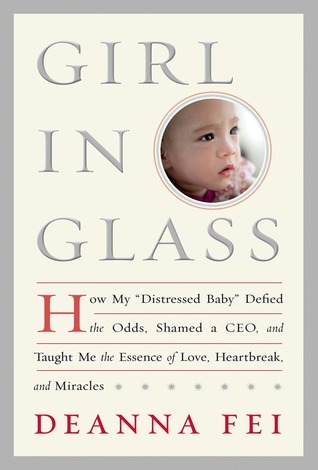 "Girl in Glass" is the story of Deanna Fei and her family, who were thrust into the media spotlight a couple years ago when the CEO of her husband's company stated that her child was one of the reasons that he had to cut benefits for the company. In "Girl in Glass," we see how Fei deals with the super early birth of her daughter, the hurdles that brings, and the hurdles that are brought on by the CEO with no tact. This is an incredibly powerful book that drew me in. This book really hit home for me. 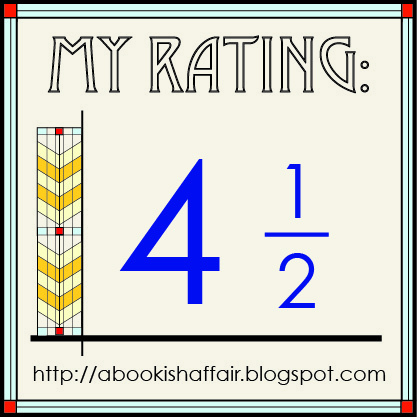 Frequent visitors to A Bookish Affair probably know that I had identical twin girls in April. I did not write much about my fear while I was pregnant but I was absolutely terrified while carrying my girls. I knew that my pregnancy was high risk off the bat because of carrying twin girls. I was always quite jealous of those lucky moms only carrying one baby who seemed to effortlessly be able to carry on with their lives while pregnant. This book shows that the grass is not always greener on the other side. There are people with "normal" pregnancies where the difficult can still occur. Fei went into labor at five and a half months pregnant and had a little girl. She takes us into the NICU, a place that is both amazing and heartbreaking, sometimes at the same time. I thought there was a good chance that my girls would end up in the NICU. Fei talks of her guilt and worry over having done something that made her daughter come so early. Having gone through that myself to some degree, she really captured that well. You really do feel helpless and like there had to have been something you could have done differently. It is hard to explain all of those feelings that you go through but Fei explains it perfectly. This book pulled me in hard. You feel for the entire family. Without the CEO debacle, the whole situation still would have been so incredibly difficult. This book shed a light on how benefits may not be as beneficial as they could be for families in need. Those who care about families and worker's benefits will be drawn to this book. Those who are looking for a real and raw memoir will also be drawn to this one! What a read! 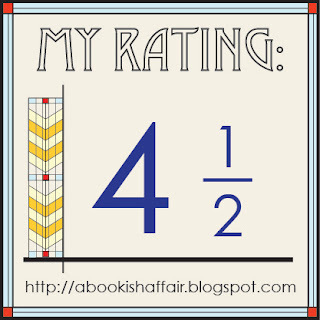 I am thrilled to have the author here on A Bookish Affair today! After the birth of my second child—a birth so premature and inexplicable that the doctors called it “catastrophic”--I thought I might never write again. At the very least, I thought I could never write the story of her arrival in the world. The circumstances of my daughter’s birth had upended everything I thought I knew about how life is supposed to begin: the long labor, the final push, the radiant perfection in the face of a new baby. That’s how my first child, my son, had been born—on his due date, no less. Everything that followed his birth had been a continuation of that story: a triumphant birth story. As I held him and nursed him and watched him flourish, I couldn’t help thinking that I must have done everything right to have a baby as healthy as this. One year later, when my daughter arrived nearly four months premature, I struggled to even say the words, She was born. Her existence was suspended between birth and death, hope and fear, nature and science. And as I helplessly watched her cling to life support day after day, I couldn’t stop castigating myself for what I must have done wrong to cause her premature birth. Something I ate, something I touched, something I thought. Even after she came home and seemed to thrive, the circumstances of her birth still haunted me like a terrible secret. Then, just as she took her first steps and I finally began to breathe a little easier, my husband’s CEO publicly blamed her medical needs for a cut in employee benefits, portraying us as outsized burdens on the corporate balance sheets. He used a dehumanizing term, “distressed babies,” that set off a national firestorm. It was only as I struggled to understand how my private trauma had become the subject of countless headlines that I began to question the blame I had heaped upon myself. I finally broke through my shame and guilt to speak out to defend my daughter’s basic humanity. Then, as the story went viral, I received an outpouring of messages from strangers across the country who embraced my daughter’s story and entrusted me with their own. Stories of premature babies, sick newborns, children who needed intensive care for any reason. They showed me the perils of a culture that blames and shames women who suffer medical crises related to pregnancy and childbirth—and taught me to absolve myself. They brought me back to the power of telling our stories—especially when that story is the most fundamental story we tell: the story of how our children arrived in the world. And they inspired me to write GIRL IN GLASS. It’s my hope that this book will help others feel less alone, just as the stories of others helped to save me. Deanna Fei is the author of the new memoir GIRL IN GLASS, hailed as “extraordinarily beautiful” by NPR and “an impassioned, important book” by the Washington Post. GIRL IN GLASS was recently featured on Melissa Harris-Perry on MSNBC, PBS NewsHour, and NPR’s All Things Considered. Her debut novel, A THREAD OF SKY, was named a New York Times Editors’ Choice and a CALA Best Book. Fei was born in Flushing, New York and graduated from Amherst College and the Iowa Writers’ Workshop. She has received a Fulbright Grant and a New York Foundation for the Arts fellowship. Her essays have appeared in the New York Times, Slate, TIME, and Fortune, among other publications. She has taught writing and counseled at-risk youth through the Asian American Writers’ Workshop, CASES, and New York City public schools. She lives in Brooklyn with her husband and two children. This sounds like a good one...but emotional. I'll have to save it for when I can handle a difficult story. It's a really powerful read! Health and privacy are such important topics! Sounds emotional.But a solid read. Fall of Poppies Cover Reveal!